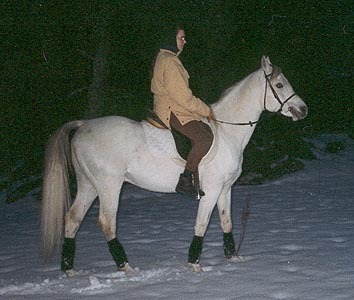 Well, this is yours truly onboard the stallion Zahmi el Anzik :) A friend of mine helped the owner with him so one day my friend rode another horse and I rode Zahmi. I hadn't been riding for a while then but she said that they never met any other horses and that he was a well-mannered stallion (which he is!). Of course we met other horses... it all went well but naturally he started prancing and bouncing screaming "Look at me!"